Audi R10 TDI® power – the force of turbo diesel! In the late 2005, Audi presented its first racing vehicle powered with a TDI engine to be first in the famous race 24 hours of Le Mans. Audi believes that this new technology can win similarly as the TFSI technology and it’s possible to run its stock production. Under the hood of Audi R10 we can find a 5.5 liter V12 diesel engine charged with two turbos. His aggregate is incomparably bigger and heavier than Audi’s V8 3.6 liter engine used in the model R8, in spite of it’s built from aluminum completely. The engine works in very low revs, between 3000 and 5000 rpm, that is very unconventional in the case of racing car. Also the pressures in cylinders are more than usual 1600 bars. Even tough, this V10 can produce 650 hp and 1100 Nm of torque. The bigger torque means that the pilot shouldn’t shift gears so frequently as in the R8 model. Also the construction of chassis was changed radically. It’s visible now the different way of monocock and chassis’s connection. The R10 is visually more aerodynamic and has spikier nose than the R8. Audi and Bosch developed a new system of telemetric data transmitting. Now all values can be seen on the display placed on the steering wheel. Next cooperation brought specially developed Michelin tires to reduce under-steering. Another practical thing is higher reliability and simple construction. This are attributes also of the R8, but now it’s improved again. And the result is less human work on its service than other racing cars. On 18 June 2006, the #8 Audi R10 placed first at the 2006 24 Hours of Le Mans, completing 380 laps, more than the R8 did, but less than the record set in 1971. 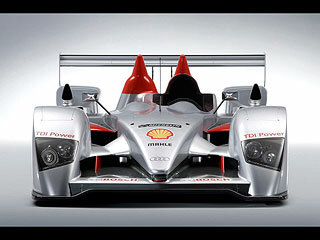 The power of diesel was revealed on 19 March 2006 at the 12 hours of Sebring in Florida, where racers Dindo Capello from Italy, Tom Kristensen from Denmark and Scotch Allan McNish won the race first time in the history with the diesel engine. Audi R10 did down in history at the race where 30 degrees of Celsius was and the asphalt had 43 °C. Both triumphs of the R10TDI proved that diesel engines have bright future and they can’t be underestimated and the diesel is definitely solid part of the racing world.